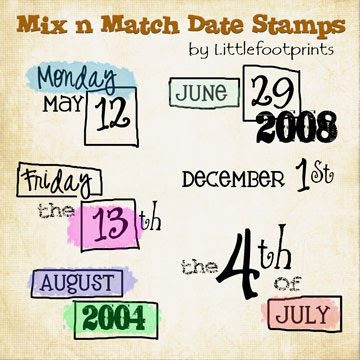 This time I have some Mix n Match Date Stamps for you to use. I'm not sure why I called them "stamps"...they are not brushes. They are all in PNG format. Just cut and paste! I had fun making these! Don't be surprised if you see more of these from me later on, in different fonts. ;) That will give you even more to "mix n match"! I also will be putting some seasonal (winter, spring, summer and fall) "stamps" up, too. I love the date stamps; I think they'll be lots of fun to use again and again. Thanks so much! Thank you! Your blog post will be advertised on the DigiFree Digital Scrapbooking Freebie search engine today (look for timestamp: 23 Jun [LA 12:38am, NY 02:38am, UK 07:38am, OZ 05:38pm]). Thank you so much - such fun & really useful. oh my word!!! these are smashing!!! i'm a date junkie and this is making me very happy!!! I"ve been wanting some date stamps! Thank you so much! This is a handy thing to have! Thanks for sharing! Love it! Never bothered with date stamps until now ... these are fabulous! Thank you. Thanks so much for these great date stamps - they will add so much to my scrap pages! This is great...very versatile. Thanks so much!! Must say I agree with the other gals that these look like they are going to be really fun to work with! Thank you for this great set! These are just so cool! Thanks so much! thank you for this lovely freebie and also for all the cute quotes!!!! WoW this is amazing, thank you so much for sharing! Another post today-with another freebie!